Dave’s Supermarket is opening a new supermarket in the Midtown neighborhood as part of the Link59 project. 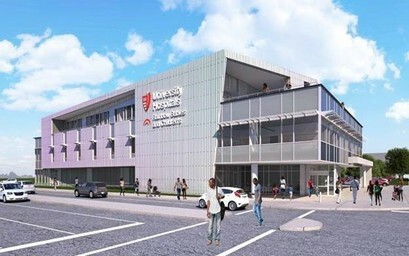 Link59 is an 11-acre campus located in the center of Cleveland’s Health-Tech Corridor, immediately adjacent to the future University Hospital Rainbow Center for Women and Children. The store will house a pharmacy, bank, and neighborhood gathering space. Hemingway Development and Dave’s Supermarket Inc.
Dave’s Supermarket will be a full-service grocery store including pharmacy and bank. The project is located in a food desert. Patients of the UH Rainbow Center for Women and Children will receive healthy food “prescriptions” from care providers for redemption at Dave’s. WIC, SNAP and other subsidies will be accepted in order to make the purchase of healthy food choices affordable. In addition, Dave’s will provide cooking classes and seminars to educate neighborhood residents on the benefits of healthy food choices. The developer is utilizing storm water management designs to reduce run-off volume.